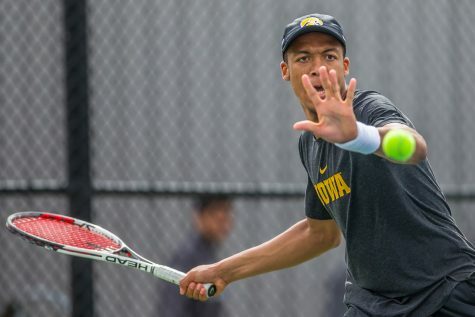 With its regular-season finale quickly approaching, the Iowa men’s tennis squad needs a push to improve its placement in the Big Ten Tournament. 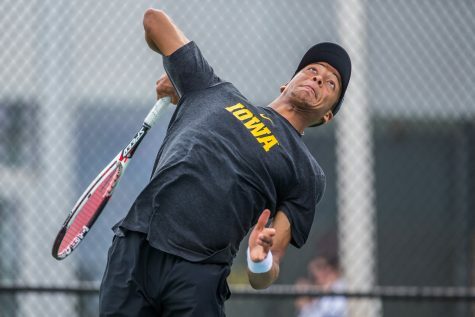 Iowa's Kareem Allaf hits a backhand during a men's tennis match between Iowa and Ohio State at the HTRC on Sunday, April 7, 2019. 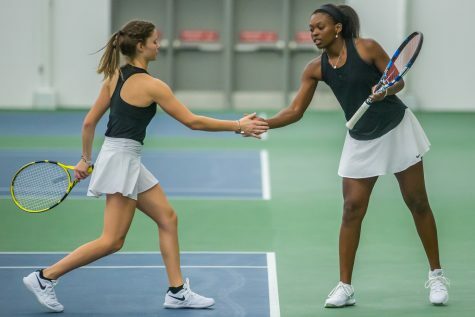 The Buckeyes defeated the Hawkeyes, 4-1. 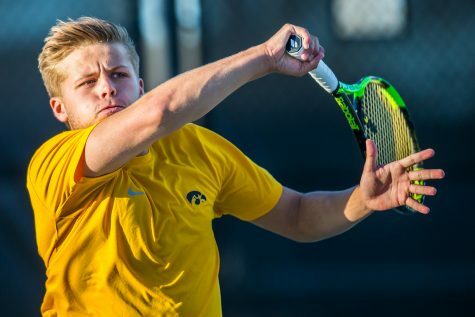 Meet Iowa, the Dr. Jekyll and Mr. Hyde of college tennis. 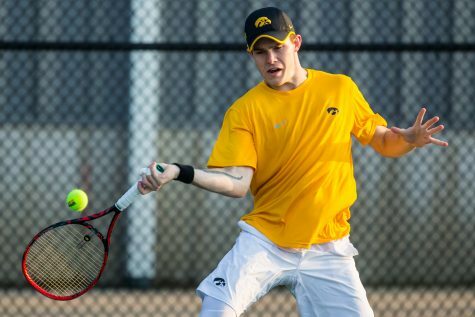 One week, the Hawkeyes are downing ranked opponents with solid doubles play and an energetic core in singles. The next week, they’re blanked by an inferior Indiana team on the road in a vital conference matchup. The Hawkeyes have spent most of the season ranked in the Intercollegiate Tennis Association’s top 50. In addition, they have a young and talented No. 1 doubles duo in freshman Oliver Okonkwo and sophomore Will Davies that has spent a considerable amount of time in the doubles rankings. Still, the team has failed to string together weekends of dependable play since conference matches started on March 10. 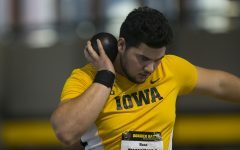 Iowa has one last weekend of regular-season play to work out its weaknesses before the Big Ten Tournament begins on April 25 in Ann Arbor, Michigan. Iowa has mostly taken advantage of its home court in marathon matches. Playing in a familiar environment with crowd noise on your side is important in tennis. 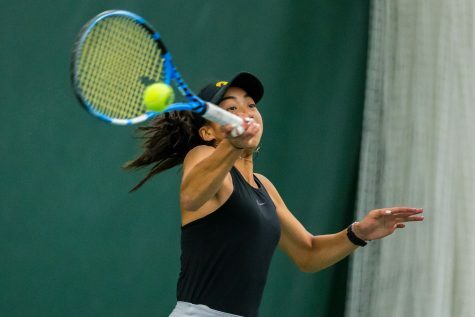 It’s especially crucial considering the Hawkeyes have often started four underclassmen in singles. With its last three matches at home, Iowa hopes its late-game heroics can continue through one more weekend. Iowa sits even with Northwestern and Minnesota in Big Ten play, and all three are comfortably in the middle of the Big Ten standings. 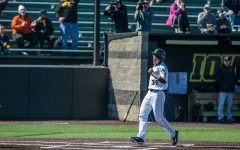 With a win against the Gophers and a loss to the Wildcats earlier in the season, the Hawkeyes could use a big upset on April 21, when Michigan visits the Hawkeye home. Luckily for Iowa, its match against the Wolverines is sandwiched by visits from two basement-dwellers in Michigan State and Illinois State. Both are winless in their respective conferences. Northwestern and Minnesota face each other in their regular-season finales, leaving a great opportunity for the Hawkeyes to create separation from at least one of those teams. 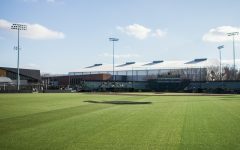 Should it come down to it, the result of Iowa’s final match against the Redbirds could be the deciding factor in its overall record, thus determining its seeding for the conference tournament. 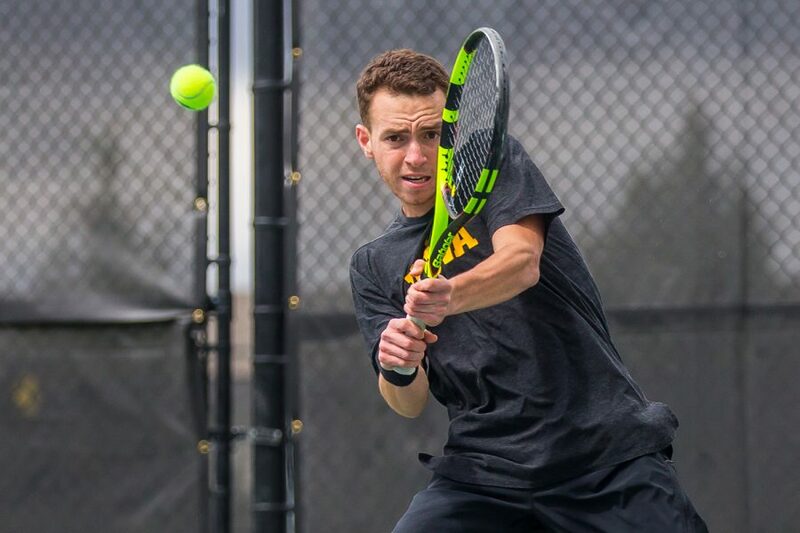 A pair of slight 4-3 victories are all Iowa has to show for itself in matches against fellow top-50 teams. One of those triumphs required Davies to hang on for a 7-5 mark in the third set against No. 30 Penn State. While the losses include dropping a match to No. 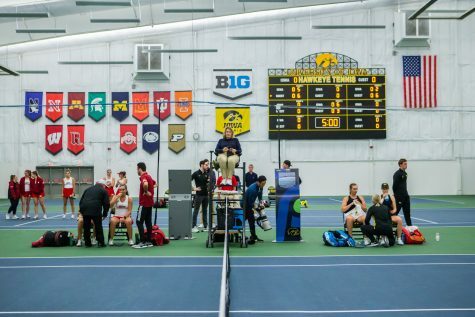 1 Ohio State, Iowa has also fallen hard to Arizona and Illinois by the scores of 6-1 and 5-1, respectively. 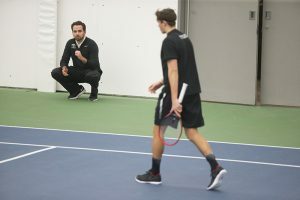 Iowa head coach Ross Wilson’s squad has to return its focus to doubles; oddly enough, the Hawkeyes won both of the ranked matches where they secured the doubles point. When faced with a challenge, the Hawkeyes have tended to resort to defensive, conservative play. 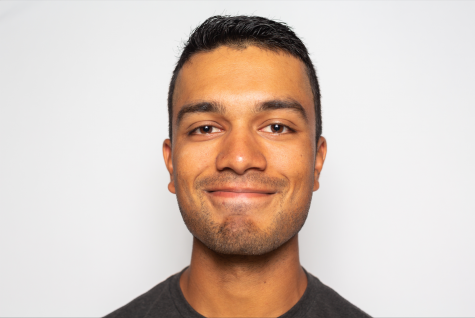 That type of approach will not cut it against Michigan this weekend, nor will it do against Illinois or Ohio State, should the teams have a rematch in the tournament.